Dropping the Saturday fun activity must have been a good idea, because nobody ever mentioned it, never mind complained, and I never gave the change a second thought. Until Monday. My pal Bill Savage, Northwestern literature professor, baseball scholar, and salvager of lost works, was talking about the Women's Christian Temperance Union and prohibition at the Whiskey Thief bar in Evanston. I thought I'd slide by for illumination. I enjoyed listening rather than taking notes, so can only touch upon how he wove the national drive against alcohol to class, culture and politics. Let's put it this way: the goal wasn't so much to suppress booze as to thwart the sort of people who drank it. 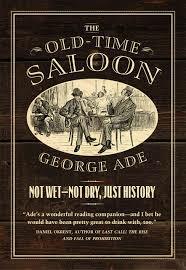 The talk was to promote publication of George Ade's "The Old-Time Saloon," a 1931 celebration of drinking establishments that Bill rescued from obscurity and released, with the help of the University of Chicago Press, including his own sharp forward and notes. When Bill was done, I thought I would lead the charge and buy a copy. The trouble was, I already have two copies of my own. A dilemma I brushed aside by rationalizing that I could give the book away here, by reviving the contest just this once. I asked him to sign it to the winner and he did. A toughie, I know. But one reason I was so happy about scrapping this is that you guys always solve it within the first 10 minutes. Not so, I have reason to believe, today. Where is this charming old car dealership sign? Because it is so difficult, I will give a hint: it is more than 80, but less than 100 miles from Chicago. The prize is a funny, thought-provoking and timeless read and well worth the effort. Good luck. old route 66 in Joliet? Right before, or after depending on your direction, the big bend in town. Terry Bentz Buick Marseilles, Illinois Dale B. The great Dale returns! Amazing. Tell me -- how did you figure that out? I drove around the entire 100 mile radius of the city until I found it. Ok, maybe that's a bit of an exaggeration. I googled "old Buick sign in Illinois" and the first hit I got was a Pinterest site which featured this sign. I feel slightly guilty that it was that easy but it is quite possible that I once drove by it in the past 5 years. It worked. I have your address somewhere, but send it to me again, if you don't mind. dailysteinberg@gmail.com. It's a fun book. Now that you mention it, every Saturday morning I click on the RSS link to EGDD hoping against hope that the day's post will be an errant fun activity. Considering I don't think I have ever recognized a single one, and thus never had the slightest hope of snagging one of your highly coveted posters, I can't even explain why get it gives me such joy. So please don't think it goes unnoticed. I'm just not the complaining type. Maybe we'll bring it back for the summer then. I like to keep readers happy. Agreed, I enjoyed the Saturday fun activity quite a bit (won it twice, including the best prize ever, lunch with Neil, not to gloat...though I was not a very interesting lunch mate). That said, I imagine it is quite a bit of work to put one together every dang week, so I understand the occasional nature of it now. All of Illinois is losing "custody." Would this read better if Medill were accredited? But the clocks come with it, right?